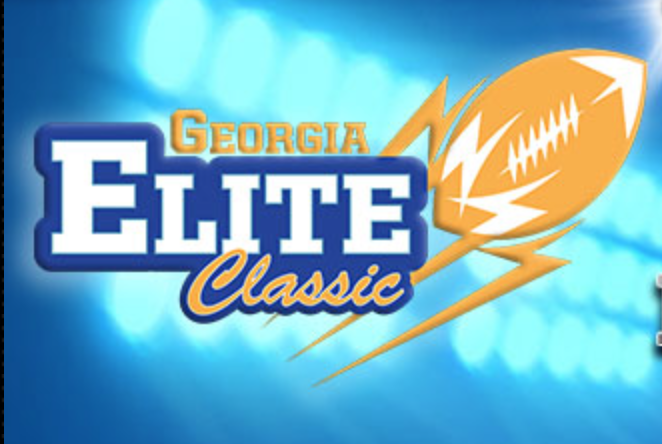 The National Team used 38 unanswered points, including a 24-point third quarter to run away with a 38-7 victory over the American Team in the Junior game of the Georgia Elite Classic. The American team scored first on a 34-yard run by Eagle’s Landing’s Cameron Lewis and closed out the first quarter with a 7-0 lead. North Gwinnett quarterback Cade Fortin connected with Archer fullback Brandon Shelnutt on a 2-yard touchdown pass midway through the second quarter to tie the game 7-7. The Shenutt touchdown catch capped off a 10-play, 71-yard drive. The National team took its first lead of the game with 2:24 left in the half as Mike Barrett (Lowndes) crossed the plane for a 10-yard rushing score (14-7). Benedictine running back Terrick Smalls opened the second half with an explosive 65-yard touchdown run to increase the lead to 21-7. Just over two minutes later, the National team got on the board with another 1-play drive as Tayvonn Kyle (Lowndes) caught a 35-yard touchdown pass from Barrett. Fortin tossed his second touchdown of the game with 4:32 left in the third quarter on an 8-yard pass to Miles Marshall (Parkview). After connecting on 5-of-5 PAT’s, Richmond Hill’s Joseph Petrino sent through the final points of the game (38-7) on a 22-yard field goal with :59 seconds left in the third frame. The National Team ended the game 4-4 on redzone possessions, while the National team went 0-0. Smalls led the way with a game-high 115 rushing yards off of seven carries and Kyle posted a game-high 44 receiving yards off of a pair of receptions. The National Team outgained the American team 336-to-217 in total yardage, in part to a 215-to-100 yard advantage on the ground. Defensively, Peachtree Ridge’s Kingsley Enagbare posted a stellar effort with 3.5 sacks, five tackles for loss and six solo tackles. Tyler Bird (North Paulding) led the National team with six solo tackles and three tackles for loss.